This is the fourth (or is it fifth or sixth) boxing of this aircraft by Bronco. There are five grey sprues attached in two major sections along with a clear sprue. Typical of current 1/72 aircraft kits, the interior is well done, but Spartan, with a tub, seat, control stick, rudder pedals and an instrument panel. This sits atop the nose gear well piece. The instructions show 10 grams of weight being needed, but finding room for it will take a bit of work and most will pack weight behind the cockpit. The nose is separate from the rest of the fuselage, and in this case, that is a good thing as this kit provides a more square nose from the earlier boxings. There is a small bomb bay area in the back with a separate door that effectively seals off this area. A four piece engine will fit under the right wing and both wings have large tabs that go into slots in the fuselage. 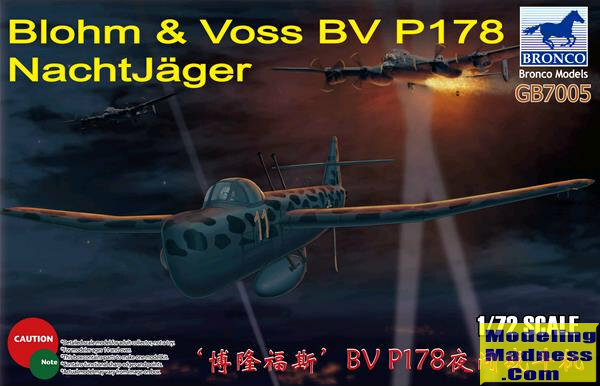 Where this kit differs is that it is the night fighter variant so there are different sprues placed in the kit for this variant. It includes a new nose, a large external tank, a ventral gun pack and some other bits and pieces. Other than that, everything is pretty much the same. One of the last steps is attaching the forward fuselage piece, but I'd do that prior to gluing the wings in case the seam needs attention. Both a single piece and multiple section cockpit covering is provided. 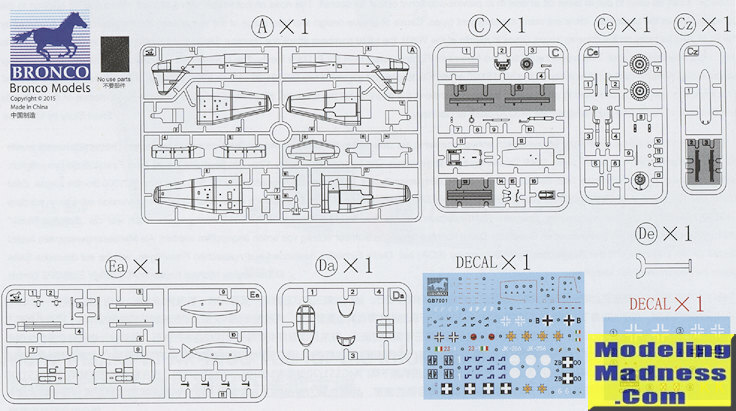 Bronco instructions are superbly done with some color coding and 3D drawings to help install parts. 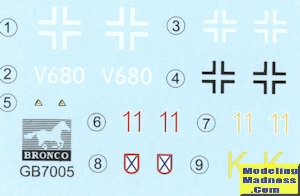 There are fictitious markings for four aircraft. You have a variety of schemes from which to choose. First is yellow 11 in overall RLM 76 with large patches of RLM 75 on the upper surface. This has the fuel tank on the centerline and two oblique cannon. Next is red 11 with the same set up but with a black under surface and smaller upper splotches. In a light green over RLM 76 and yellow fuselage band and lower nose is V680, undoubtedly a prototype. No oblique cannon on this, but a ventral canon pack. The last is an ROA plane in RLM 76 with RLM 81/82 upper wings/tail planes and large black and red fuselage band. This is also equipped with the ventral canon pack. 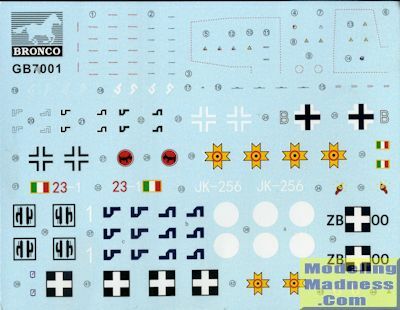 In line with other kits in this series, you are given a large standard decal sheet with a smaller one that contains the special markings applicable to this boxing. I built the initial boxing with the bomb and found that it went together quite well. The biggest challenge of the kit is having enough weight forward of the main gear to keep it from tail sitting. Bronco have included a clear tail stand in case you cannot find sufficient space. It will take a bit of ingenuity, but can be done. The result will be a neat and somewhat unusual model.